"We thought blood transfusions can cure her disorder. She responded well after two cycles of blood transfusions. On the day of her discharge, she started throwing up and suddenly she got violent seizures. Soon, the right side of her body was paralyzed and she was not able to talk. The internal bleeding in her brain caused frequent seizures. I thought I would lose her forever. However, she stayed strong despite having extreme fatigue. 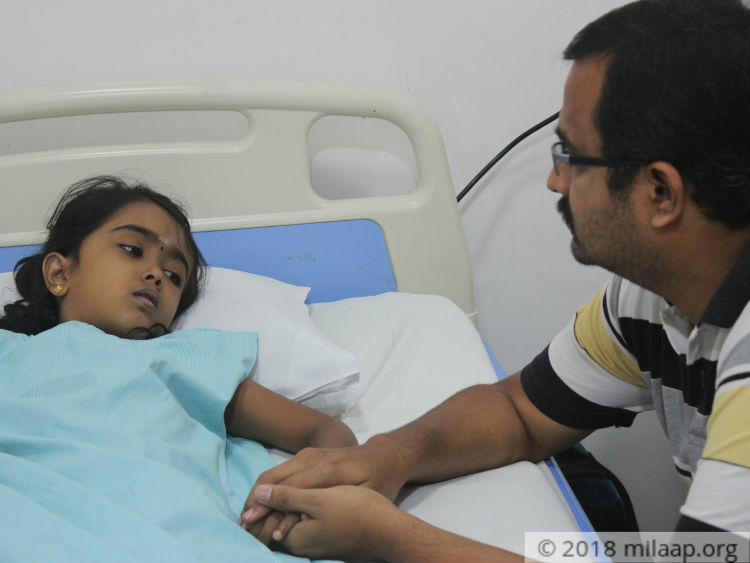 But I’m losing hope - a bone marrow transplant is the only way she can survive but I can’t afford that.” – Sriram, Father of 8-year-old Dhanya Shree. Dhanya Shree is the only child of Sriram and Supriya. She was born healthy and grew normally except that she never gained weight. Yet, she was active all the time and never fell sick so there were no reasons for her parents to suspect anything serious. She was given number of tablets to gain weight but it did not help her. When her parents took her to a bigger hospital, blood tests showed that her hemoglobin count was too low. 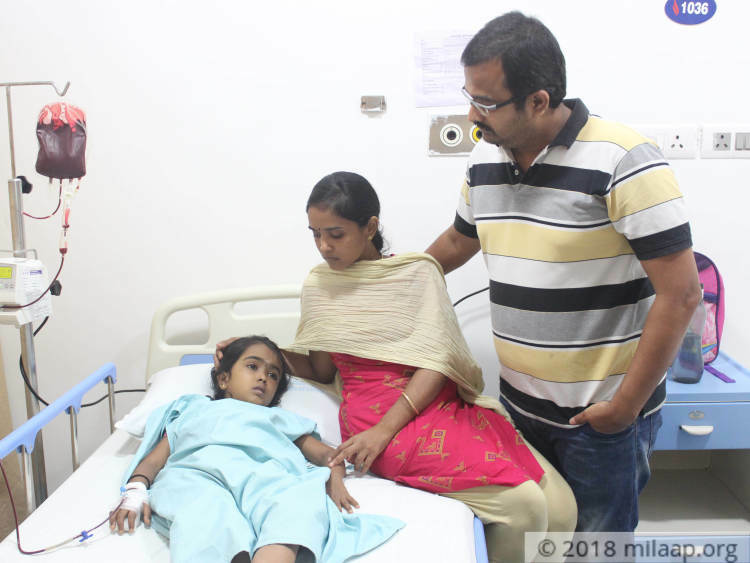 She was referred to a hematologist and further tests confirmed that she has Thalaseemia, a rare blood disorder characterized by less oxygen and fewer red blood cells. It results in large number of red cells being destroyed. “We were shocked to see her suffering from violent seizures. We immediately shifted her to another hospital. After an urgent surgery and a month of physiotherapy, she became normal and was able to talk. 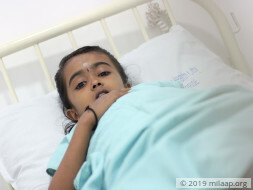 It has been two years since she went to school and her life is confined to the hospital. She has been through so much of pain at this young age. She is tired all the time. Her little body is poked with needles everywhere but she has never complained. All she needs is my presence. She trusts me so much but the fear of failing her is killing me deep inside.” – Sriram. Little Dhanya is surviving only through blood transfusions. She needs it every month but there are times her condition would deteriorate so much and she would need it every week. Despite the pain, she has always stayed strong and positive. She has become one of the favorites of the nurses and doctors in the hospital. But her parents who are aware of her painful journey ahead is spending sleepless nights. “Doctors have told that blood transfusions are not enough anymore and it can lead to excess of iron content in the body which will affect all her internal organs. Only a bone marrow transplant can save her life. She keeps asking me, ‘Amma, when will I get the transplant’. I don’t know how she has perceived the meaning of a transplant. But she knows that she doesn’t have to come to hospital after the transplant and she is looking forward for it. I’m struggling to fight my tears back and stay strong in her presence. 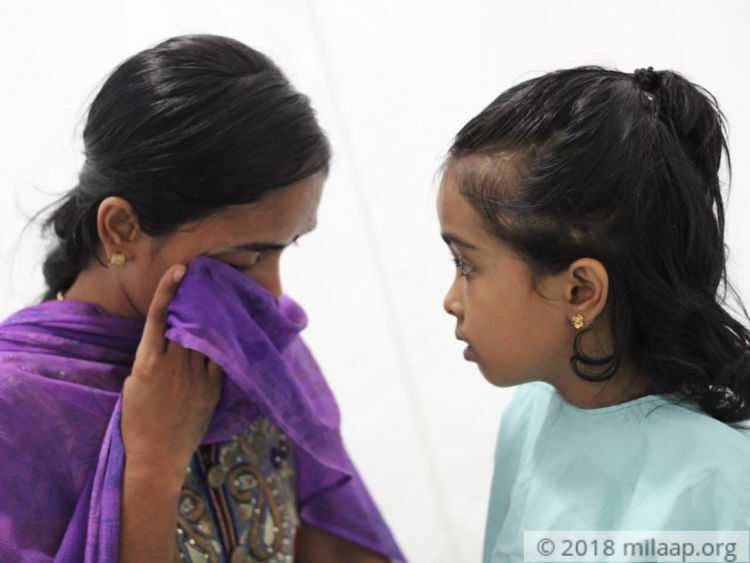 I don’t know how long I can endure this trauma.” – Supriya. Sriram works in a BPO for a meager salary. 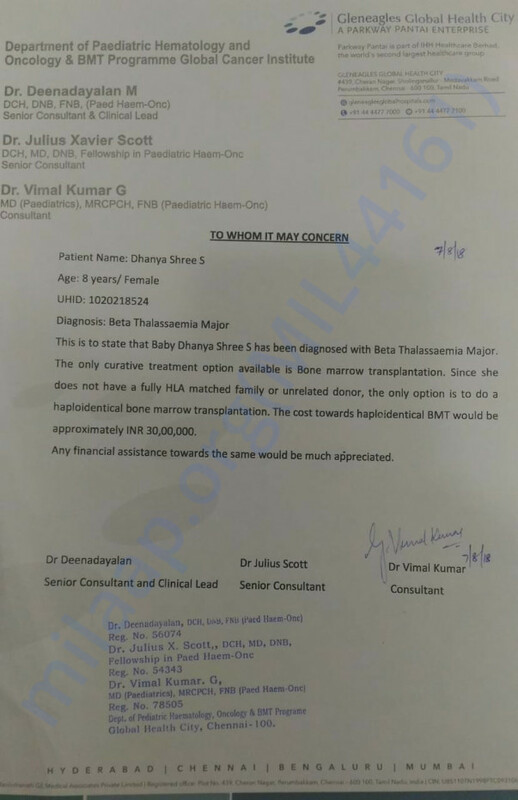 He has spent around 25 lakhs for Dhanya’s treatment. He is neck-deep in debts. He managed so far with the help of his family, friends and colleagues. He is determined to save his only child at any cost. He left no stone unturned in saving his daughter, but now he is left with nothing. “Every day I see a lot of parents struggling to comfort their children, telling different stories to bring them to hospital and children refusing to take injections. But I never faced any of these; my daughter trust me so much and she listens to us. She is hopeful of coming back home. My only challenge was the financial constraints. I did everything that is possible to continue the treatment but now I don’t know what I can do. I feel terrible, I can’t bear the thought of losing her. Every passing minute is a risk to her life.” – Sriram. 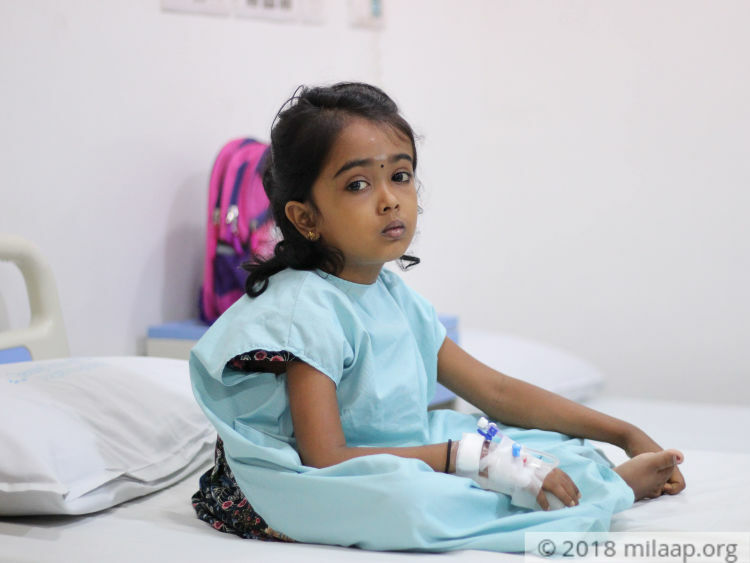 8-year-old Dhanya is battling a dreadful blood disorder. Blood transfusions are not enough anymore and she needs an urgent bone marrow transplant to recover completely. This little girl, despite enduring a lot of pain and trauma is hopeful of going back home. Her parents have spent everything they had and now they are desperately waiting for help to save their only daughter. 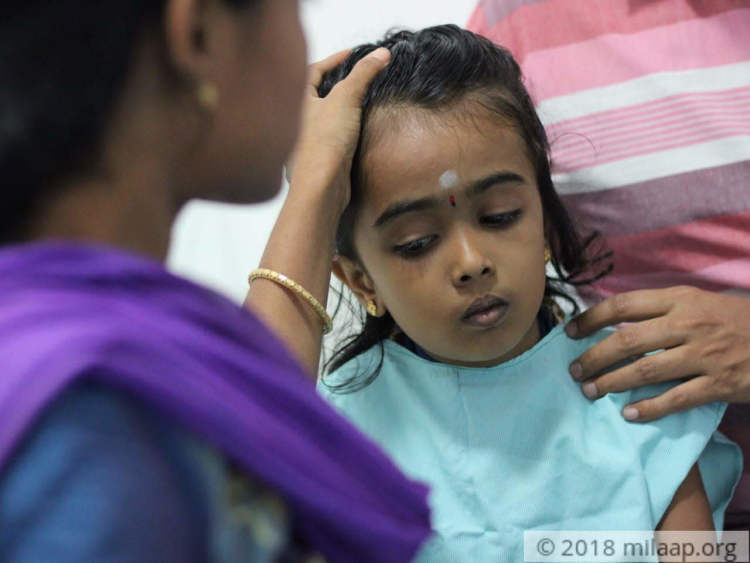 Little Dhanya cannot survive without your support. Dhanya is currently doing well and she is yet to undergo the bone marrow transplant. She is likely to be admitted in the hospital on August 26th for the procedure and the infusion of the new stem cells. She is now at home and is on medication. 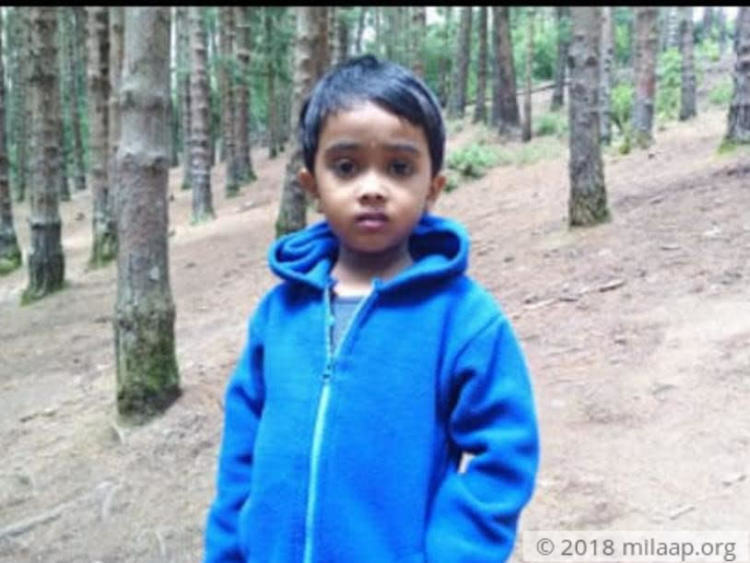 Dhanya's mother has been identified as a potential donor and we are all hopeful about her recovery. Please keep praying for her. We shall keep you posted.